Henry Beaufort, 3rd Duke of Somerset (26 January 1436 – 15 May 1464) was an important Lancastrian military commander during the English Wars of the Roses. He is sometimes numbered the 2nd Duke of Somerset, because the title was re-created for his father after his uncle died. He also held the subsidiary titles of 5th Earl of Somerset, 2nd Marquess of Dorset and 2nd Earl of Dorset. 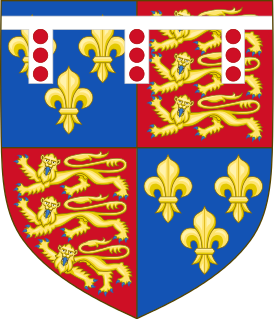 Somerset, born about January 1436, was the son of Edmund Beaufort, 2nd Duke of Somerset, and Eleanor, daughter of Richard Beauchamp, 13th Earl of Warwick and widow of Thomas, fourteenth baron Roos of Hamlake. [a] From 1443 to 1448 Henry was styled Earl of Mortain or Morteign, and from 1448 to 1455 Earl of Dorset. While still a youth he fought at the First Battle of St Albans (1455), where he was wounded and his father was killed; thereby he inherited the title of 3rd Duke of Somerset. He was regarded as "the hope of the [Lancastrian] party", but he also inherited the "enmities entailed upon him by his father's name". He was brought to the council at Coventry, where in October 1456 an effort was made to reconcile the two parties; but the meeting was disturbed by quarrels between Somerset and Richard Neville, 16th Earl of Warwick, and by a brawl between Somerset's men and the town watch of Coventry. In 1457 Queen Margaret of Anjou suggested a marriage between Somerset and his cousin Joan, sister of James II of Scotland, but the proposal came to nothing. On 14 October of that year Somerset was made lieutenant of the Isle of Wight and warden of Carisbrooke Castle. Early in 1458 he took part in the council at London which again endeavoured to effect a political reconciliation, and it was agreed that Richard, Duke of York should pay the widowed Duchess of Somerset and her children an annual pension of five thousand marks as compensation for the death of the 2nd Duke. He then participated in The Love Day with the King, Queen and other leading nobles. The truce, however, was hollow; Margaret continued to intrigue against York, and in October 1458 proposed that Somerset should be appointed captain of Calais in place of Warwick. 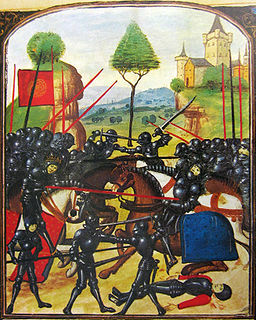 War broke out in 1459, and Somerset nearly encountered Warwick at Coleshill just before the Battle of Blore Heath. After the defeat of the Yorkists at Ludford Bridge, he was on 9 October nominated captain of Calais. He crossed the Channel and was refused admittance to Calais by Warwick's adherents, but made himself master of the outlying fortress of Guisnes (appointing Andrew Trollope its bailiff). 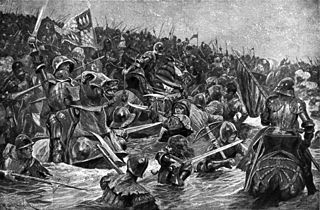 Somerset fought several skirmishes with the Yorkists between Calais and Guisnes until on 23 April 1460 he suffered a decisive reverse at the Battle of Newnham Bridge (called Pont de Neullay by the French). During his absence the Yorkists had won the Battle of Northampton, but Somerset joined the Lancastrians at Pontefract in December 1460, captured a portion of the Yorkist forces at Worksop on 21 December, and won the Lancastrian victory at the Battle of Wakefield on 30 December. He marched south with Margaret and fought at the Second Battle of St Albans (17 February 1461). This second victory was not followed up; the Lancastrians retired north, and on 29 March Edward IV won the Battle of Towton (29 March 1461). Somerset escaped from the battlefield, and in the following July was sent by Margaret to seek aid from Charles VII of France. Charles died before their arrival, but Louis XI summoned Somerset to Tours and sent him back in March 1462 laden with promises of support, but with very little else. Somerset now began to consider making his peace with Edward IV. He had been attainted by parliament on 4 November 1461, and most of his lands had been granted to Edward's brother Richard, Duke of Gloucester and other Yorkists. On his return from France he took command of the Lancastrian forces in Scotland while Margaret went to France, and in the autumn of 1462 he was holding Bamburgh Castle for the Lancastrians. On 24 December, however, he surrendered the castle to Sir Ralph Percy and submitted to King Edward. The king took him to London, and treated him with marked favour. He received a general pardon on 10 March 1462/1463, and was restored to his dignities by act of the parliament which met on 29 April following. Somerset, however, soon returned to his old allegiance. Early in 1464 he escaped from a castle in North Wales, where he seems to have been kept in some sort of confinement, and after nearly being recaptured made his way to Margaret on the borders. The Lancastrians now made one more effort to recover the crown, but at the Battle of Hexham on 15 May 1464 they were utterly defeated by John Neville, 1st Marquess of Montagu. Somerset was captured in a barn at the site of what is now known as Dukes House, and beheaded shortly afterwards that same day. He was buried at Hexham Abbey. [b] Parliament annulled the act restoring him to his dignities, which again became forfeit and were never restored. Somerset was unmarried, and his younger brother, Edmund Beaufort, was styled 4th Duke of Somerset by the Lancastrians. In 1485, some twenty-one years after his death, Somerset, along with Jasper Tudor, had all acts of attainder against him annulled in the first Parliament of Henry VII, "for their true and faithfull Allegeaunces and Services doune to the said blessed King Herrie [VI]." Somerset was described by Chastellain as "un très grand seigneur et un des plus beaulx josnes chevaliers qui fust au royaume anglais". He was probably as competent as any of the Lancastrian leaders, but their military capacity was not great. Somerset had a son, Charles, with a mistress named Joan Hill. Charles, who was given the family name of Somerset, was later created Earl of Worcester in 1514. 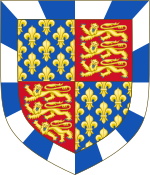 From him descend the Earls and Marquesses of Worcester and later the Dukes of Beaufort, who are the last known male-line descendants of the Plantagenets and the Second House of the Counts of Anjou. ^ Thus Somerset was a maternal nephew of Lady Anne Beauchamp, Countess of Warwick. He was a paternal second cousin to Lady Margaret Beaufort and Richard Neville, 16th Earl of Warwick (the "Kingmaker"). Somerset was also an uncle to Henry Stafford, 2nd Duke of Buckingham. ^ Traditionally his helmet from the battle was kept within Hexham Abbey from which it was taken by Colonel John Fenwick for use in the English Civil War. After Fenwick's death at battle of Marston Moor the helmet was retrieved along with his skull, both were returned to the Abbey. The helmet is currently on display in Hexham Old Gaol museum. ^ a b c d e f g h Pollard 1901, p. 157. ^ Pollard 1901, p. 157 cites Ramsay. ^ Pollard 1901, p. 157 cites Stubbs, iii. 171. ^ Pollard 1901, p. 157 cites W. Worcester, p. 479; Chron. ed. Davies, p. 84; Hall, p. 206. ^ Pollard 1901, p. 157 cites Cal. Patent Rolls, 1461-5, pp. 29, 32; Stubbs, iii. 1960. ^ Pollard 1901, p. 157 cites Cal. Patent Rolls. 1461-5, p. 261. ^ Pollard 1901, p. 157 cites Rot. Parl. v. 511. ^ Pollard 1901, pp. 157–158. ^ Pollard 1901, p. 158. Baumgaertner, Wm. E. (2010). "Henry Beaufort, third Duke of Somerset, Lancastrian Military Commander". Squires, Knights, Barons, Kings: War and Politics in Fifteenth Century England. Trafford Publishing. pp. 360–361. ISBN 9781426907692.
btilley (26 October 2007). "Debunking myths about the real Battle of Hexham". Hexham Courant. Archived from the original on 29 February 2012. Edmund Beaufort, styled 4th Duke of Somerset, was an English nobleman, and a military commander during the Wars of the Roses, in which he supported King Henry VI. Thomas de Ros or Roos, 9th Baron de Ros of Helmsley was a follower of the House of Lancaster during the Wars of the Roses. John Wenlock, 1st Baron Wenlock KG was an English diplomat, soldier, courtier and politician. He fought on the sides of both the Yorkists and the Lancastrians in the Wars of the Roses. He has been called "the prince of turncoats", although some historians suggest the label may not be fair. Others contend that even when Wenlock was not actually changing sides, he was engaged in "fence sitting par excellence." Robert Hungerford, 3rd Baron Hungerford (c.1429–1464) was an English nobleman. He supported the Lancastrian cause in the War of the Roses. In the late 1440s and early 1450s he was a member of successive parliaments. He was a prisoner of the French for much of the 1450s until his mother arranged a payment of a 7,966l ransom. In 1460 after successive defeats on the battlefield he fled with Henry VI to Scotland. In 1461 he was attainted in Edward IV's first parliament, and executed in Newcastle soon after he was captured at the Battle of Hexham.